The Hold Steady's Stay Positive [Rough Trade 460] was just a little too reticent even with the Wyred4Sound kilowatt monos while the guitars lacked a tad in sting and leading-edge excitement. The percussive staccato attacks of Pepe Romero's virtuoso flamenco guitar [Philips/FIM K2HD022)] were slightly rounded off and did not sparkle as brightly as I would have preferred. That said, the tone of Romero's guitar was nothing less than sublime and the Hyperions never failed to convey the musical message. modern speakers, mostly on those with a hopped-up presence region to give the illusion of greater detail which always becomes tiring after a spell. There is no such tomfoolery with the Hyperions. They were the epitome of smooth, suave and sophisticated. Occasionally I noted a few colorations such as a slight hollow cupped-hands effect. There was also a slight wheezy resonance in a narrow range noticeable on cymbals and female vocals. My 15-year-old bat-eared son picked up on this right away without any prompting. While the Hyperions performed a decent disappearing act, I was occasionally aware of certain sounds emanating directly from the enclosures. However, these colorations seemed to lessen after a few more weeks of steady play. Tilting the speaker slightly back on its footers also helped to reduce the cupped-hands effect. I have noticed the same with other speakers where my seating height put my ears above their tweeters. Comparing the Hyperions to other speakers I had on hand was a bit like comparing apples to oranges and thus of little value in my opinion. 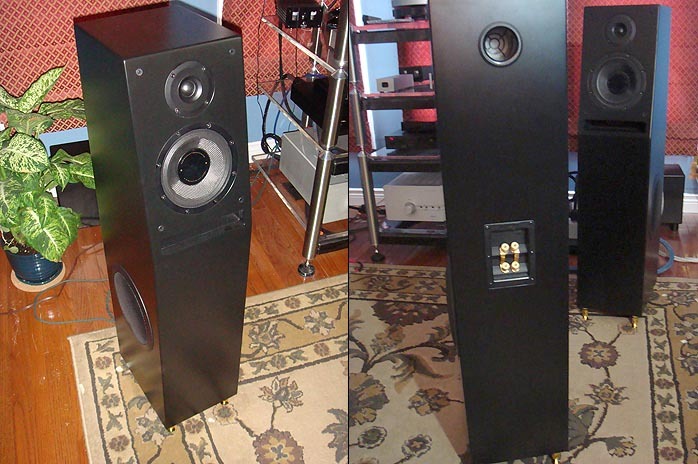 My Green Mountain Audio Callistos are small 2-way stand mounters with limited bottom end extension and weight while the AV123 Strata Mini is a larger 3-way hybrid design with planar magnetic and conventional drivers plus built-in powered subs. The Hornshoppe Horns are a completely different kettle of fish with their single driver horn-loading design. Arguably, the Strata Minis offers the best value of the bunch but then again, the Strata's drivers are not as seamless in operation as the Hyperion nor is either speaker anywhere near as transparent as the Callistos. Neither do they nail micro transients i.e. drumsticks on metal rims, tablas, the rapid strikes of flamenco guitar and other sharp percussive sounds to the same extent. However, due to their diminutive dimensions, the Callistos obviously possess a considerably restricted bottom end, which is why I generally use a pair of subs. Incidentally, I did try my REL Q108s with the Hyperions near the end of the review period. While I attained a copasetic match, I was perfectly happy to go sub-less. The Hyperion HPS-738 was not the most exciting loudspeaker I have heard at this price point and probably would not be an ideal choice for adrenaline junkies. However, this visually understated yet attractive speaker consistently held my attention with its rich, golden, full-bodied tonal balance and should arouse interest from those who seek a more forgiving and relaxed listening experience. It was indeed a pleasure to have a pair of such speakers in my home during the last several months. I was sad to see them leave. They were tonally completely at odds with most contemporary loudspeakers which usually sound tipped up in balance to give a false sense of enhanced detail and space. No doubt, you might find a similarly priced speaker that beats the HPS-738 in certain areas. However, I suspect it might be a tad difficult to find one as agreeable and easy on the ears as this one. Yes, there were some audible aberrations but with loudspeakers more so than any other component, compromises are to be expected. The trick is finding one whose compromises you can live with. 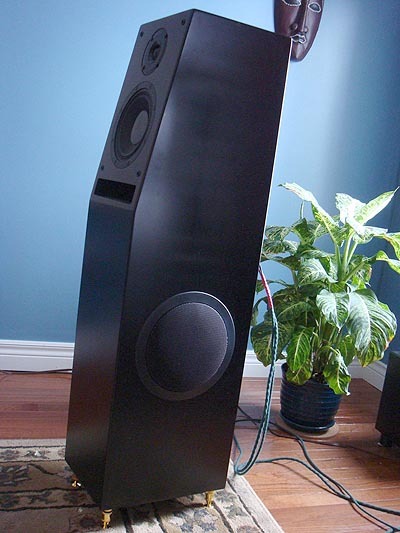 Perhaps you could achieve domestic harmony with a pair of Hyperion HPS-738 loudspeakers in your music room. Definitely worthy of further investigation then. Reusability of packing: Appears reusable several times. Quality of owner's manual: None provided. Website comments: Short on decent pictures and detailed information. Human interactions: Professional and friendly. However, a couple of email queries went unanswered. There was also considerable confusion in arranging delivery as my review loaners sat in customs purgatory for an extended period. Pricing: Seems competitive with other similarl floorstanders. Final comments & suggestions: A basic setup manual with tips on placement would be beneficial. When I enquired about this, I was told that dealers would assist customers in setup and placement. That's assuming you can find a dealer let alone a decent one. Web site should be revamped to include better photos and more product details.